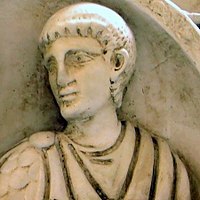 Flavius Aetius (Laitin: Flavius Aetius; 391–454), dux et patricius, commonly cried simply Aetius or Aëtius, wis a Roman general o the closin period o the Wastren Roman Empire. ↑ John Beckwith (1993) . Early Christian and Byzantine Art. Second Edition, new impression. New Haven and London: Yale University Press. ISBN 0-300-05296-0, pp 45-46. This page wis last eeditit on 9 Apryle 2017, at 20:48.